Recent statements attributed to General Theophilus Yakubu Danjuma (Rtd), Former president Olusegun Obasanjo and deputy Senate president, Senator Ike Ekwerenmadu have been described as a conspiracy against General Muhammadu Buhari’s administration and Nigeria. 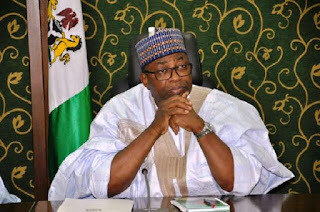 Former Minister of police affairs, Dr Ibrahim Yakubu Lame disclosed this while speaking to journalists in Bauchi Wednesday. He said that what Danjuma said was an incitement and call to anarchy. He added that the timing and the venue of his statement at a convocation ceremony where there are young and agitated minds who may be motivated by his statement to take the laws into their hands. He also lamented the accusation he labelled against the Nigerian military as being collaborators in aiding and abetting criminalities. Dr Lame therefore called on the federal government to take appropriate action against not only General Danjuma but any other person promoting hatred and division among Nigerians. He also called on Northern leaders including political office holders, traditional rulers and all stakeholders to call an emergency meeting and take measures to tackle challenges facing the north. Lame, who is also the chairman Board of Directors, National Airspace Management Agency (NAMA) said, he was surprised that despite General Danjuma's closeness to president Muhammadu Buhari and his government, he chose to make the statement which was aimed at undermining the government. He said that the north is being targeted for destruction from all fronts adding that what Danjuma said was just a tip of the iceberg and that the federal government should place the retired general and others on a serious security surveillance and get to the root of the matter. According to him, the same forces that predicted that the country will disintegrate in 2015 are at play and that, they might be planning to actualise the prediction in 2019. He also urged the political class especially in the north to wake up and provide good governance which address the issues of poverty and unemployment which was fuelling insecurity in the region. It would be recalled that before General Danjuma's statement, former president Obasanjo had written an open letter to president Muhammadu Buhari on the state of the nation. Later, deputy Senate president, Senator Ike Ekwerenmadu was quoted of allegedly warning of a possible military intervention if things did not go the way they should be.